Now that my Dad’s garden has been in the ground for 10 months, it’s time to take a look at how things are growing. We installed the plants in late August last year. I would have preferred to wait another month or two, but, well, the temptation to make use of my burly brother for digging while he was visiting was just too great. Most of the plants survived the end of summer heat waves and then spent the fall and winter establishing themselves. Our long, wet spring delayed the burst of growth a bit, but when it hit, it was exciting. 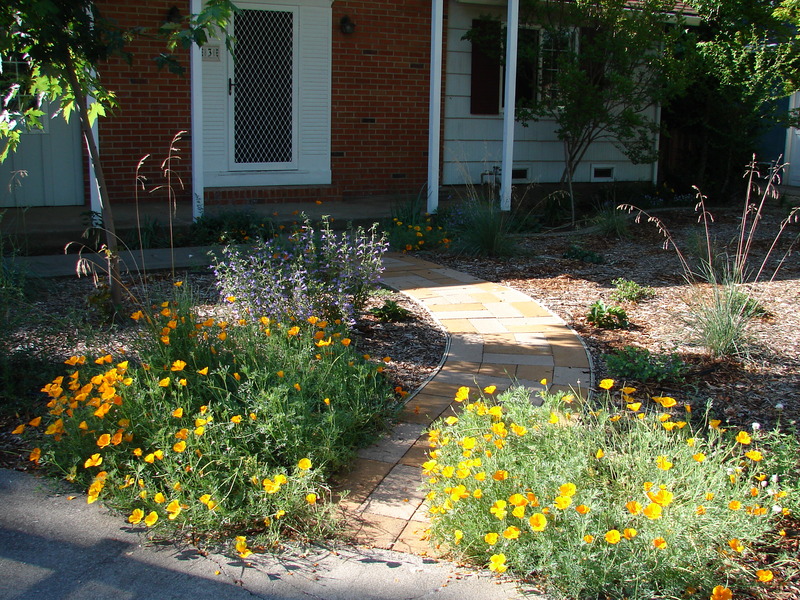 By early May, the grasses and perennials were growing with gusto and radiant with color. We enjoyed watching native bees, butterflies, and honey bees buzz the poppies, penstemon, and mint bush. 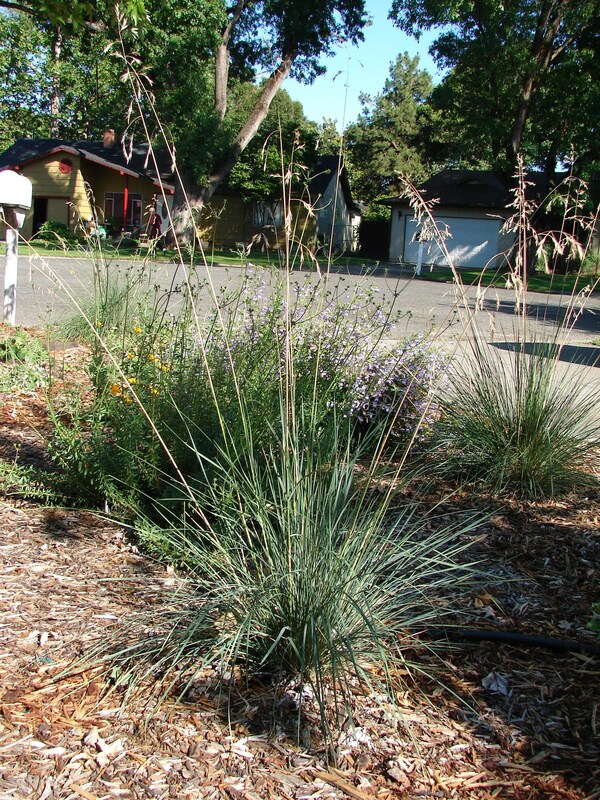 The native bunch grass, California Fescue, being a cool season grass, began filling in when the rains started last fall. In April, it lent the garden nice movement when it sent up its 4′ tall flower spikes. 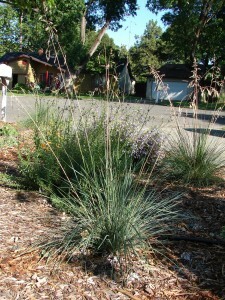 California Fescue, a native bunch grass, adds movement to the garden with it's 4' tall flower stalks. The deer grass, a warm season grass, waited until late spring to start growing. When it’s full sized, it will anchor the front of the garden which right now looks kind of sparse. The shrubs will fill in over the next couple of years. They are planted to create a dense backdrop behind the perennials and grasses and provide from the neighbor’s garage. Coffeeberry, currants, dwarf manzanita, and mock orange are all sending out lots of new grow. Just starting or getting ready to bloom now, in July, are two species of buckwheat and some narrow-leafed milkweed. With the ample moisture this spring, the buckwheats exceeded my expectations for height. In fact, the Naked Buckwheat’s flower stalks grew so tall and succulent that they flopped over in a wind storm and then continued growing up from the ground like cobra heads. Weird. I trimmed them back and the new stalks are straighter, sturdier and just about ready to flower at a more typical 2-3′ height. This entry was posted in Project updates and tagged california fescue, california native garden, California native plants, coffee berry, cool season grass, deer grass, dwarf manzanita, mock orange, naked buckwheat, native california currant, native plant establishment, penstemon, warm season grass on July 5, 2011 by admin.